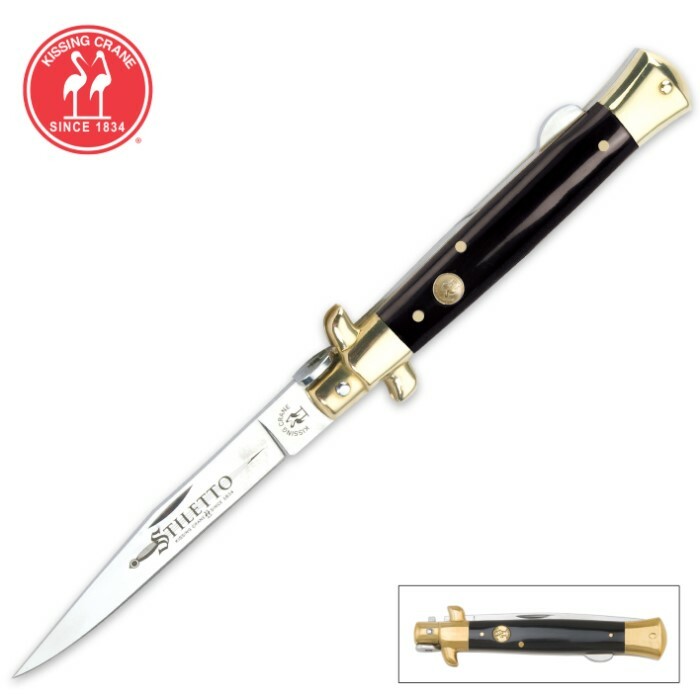 Excellent quality Stiletto knife featuring a classy black composite handle and brass pins, bolsters and a brass shield on the handle. I just got 8 knives from budk and this one was my favorite. It may not be assisted open or automatic but it is sharper than my straight razor and has a awesome look and feel to it, I absolutely love it, plus the etching on the blade makes it look all the more badass and unique. This knife is sweet!!!! I love how easy it is to open and operate. I will be getting more of these. Good looking, sharp, easier to open than to close. The locking mechanism is very stiff and difficult to release. Not to easy to open other than that great deal as two for one ,got two for 19.99. Will recommend when deal is available. Thank you BUDK for smooth transaction. I am impressed with this knife. It looks beautiful. The locking mechanism holds well, so if you know how to handle a knife, it shouldn't fold in on you, or out on you when you don't want it to. I was about to give this blade an A+ when I noticed that one of the gold metal sidings on the blade end was loose. Lo and behold, with minimal, just-testing effort I popped loose the siding. My heart sunk. I haven't tried to fix it yet. I'm about to. Maybe a dab of Gorilla Glue will do the trick... I guess I'd still recommend this blade. But for coming in a case with a letter bragging about the blade's hand-crafted, durable nature, it sure falls apart easily. I haven't even cut anything yet. it is a really good knife its sharp. but bigger than i thought it would be. This knife is good, it is very strong, it's good for cutting stuff, carving, and just a good overall knife, I have seen other colors go on sell real cheap ($1 US) i know cheap, I'm not sure if its the same, but still, anyway the only thing I don't like about it is its hard to open (if you have nails this maybe better for you) I would carry it if it had a clip, and if it was easy to open, I use another knife to open it. 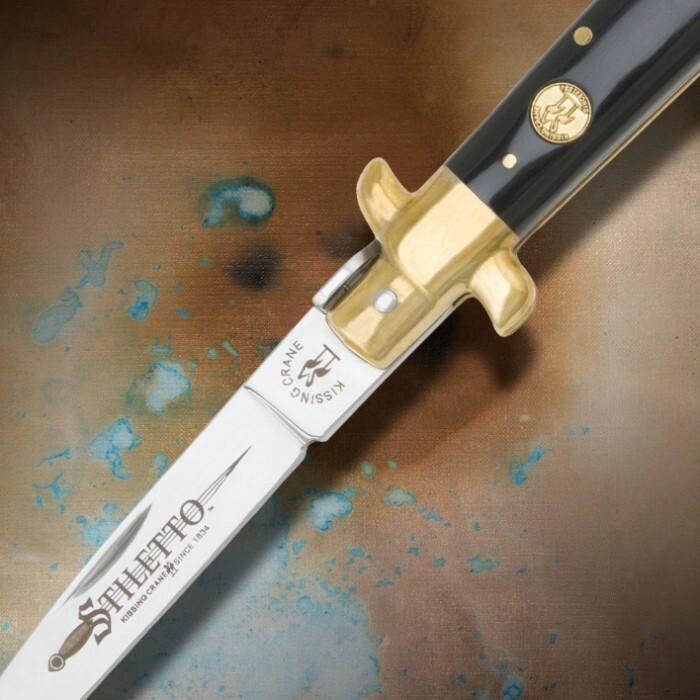 A manual opening stiletto. An awesome knife but as stated below a bit stiff to open. Other than that pretty cool. This knife is great. The only thing I don't like is it's a little stiff.